Last year I started making my Big Froufy gown. It's purpose was threefold. To use up my synthetic fabrics. To toile up a pattern to get the fit and construction right and try a few decorative designs to see which ones I liked the effect of. To have something to wear at the Guildford Heritage Festival. It almost did all of those things, accept that I ran out of time and I had to take a lot of short cuts. The corset I made to wear with it was also just a mock up and needs several changes so therefore I was unable to fit the gown bodice correctly. This year I will be a stall holder at the Festival and I intend to go in costume again. 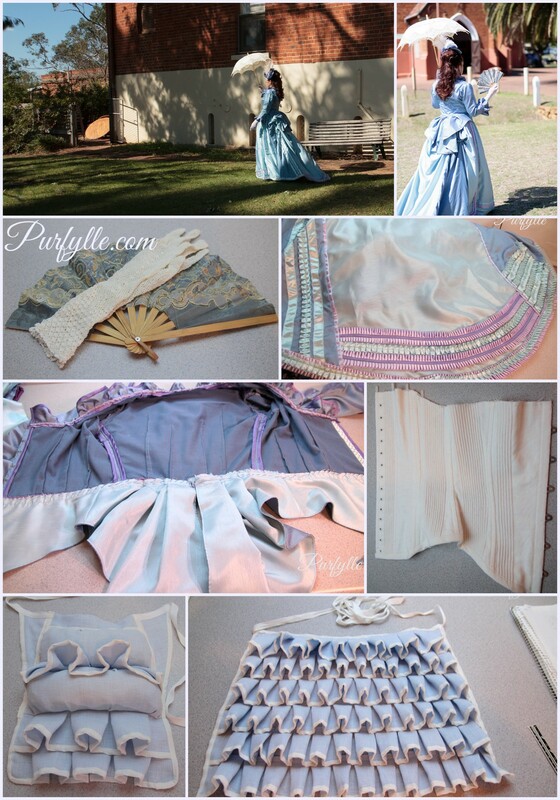 Over the next few weeks we'll be revisiting this costume and either finishing it the way it should have been done the first time or transforming it into an 1880's gown. I am beginning with foundation garments, particularly a chemise and corset. Last year the corset pattern I used was by Marna Davis from the Working Corded Corset housed at Kingfisher Chisholm Trail Museum dated to 1889-1899, but considered plausible for as early as mid 1870's. And while I would still like to re-make that corset and refine the fit and construction ,I have decided this year to make a pattern for a corset that is more appropriate for the gown. How that works out will determine what happens next to Big ol' Froufy. Hopefully she'll get finished and I can make her with some beautiful fabric. Wow! I think you did a fantastic job! Your Big Froufy gown is absolutely wonderful! Love it so much! Thanks for sharing it! Thanks Ana, I hope for it to have some serious improvements this year. There are so many layers to those old gowns. What a neat project to take on! I'm not sure why it is I start these projects so late and give myself such little time to work on them. There's still an long way to go until this is properly finished. You are one PATIENT woman!! How did they not DIE of heat stroke???? Hi Stella, making a Froufy gown is a project and a half. I have never been a seamstress (much to Mother's disappointment), but can appreciate how much work how much time and effort goes into making it (my Mum, Auntie and Uncle can all do amazing things with a bit of fabric, a needle and thread). This looks like so much fun! Stella I admire your determination and talent. Can't wait to see you all dressed up.